Um…it’s Monday again. How did this happen? Yeah, yeah, yeah I know…the sun rose and set 7 times. The earth rotated or is it revolved?? Anywho it swirled around on it’s axis seven times. (Rotated…just looked it up, sigh) The second, minutes, hours, and days ticked on by….that is how we got to Monday. But seriously, why did it have to happen so fast? I am not complaining about it being Monday. Nah…I don’t mind the start of a new work week. I mean work provides for me what I need and then some. I am able to provide for myself, have a roof over my head, many many many shoes in my closet, and a stomach full each and every day. It also provides a structure, a plan, a schedule. I like schedules, I like plans, I like structure. I do. It makes me feel sane and in control, so I plan, I schedule, I structure…No, I am not complaining about another work week. But I am complaining that time keeps going by faster and faster. Remember when you were maybe 15 years old and you rolled your eyes at your mother when she mentioned that time was just flying by. That she blinked and her kids were no longer babies but teenagers. That she just couldn’t believe that it was such and such holiday again already. Where did this year go? Remember those motherly mutterings? Remember thinking that she was a tad bit loony? That how could she possibly think that time was going by fast…to a mere 15 year old it was crawling by. Remember telling yourself that you would never utter the words … ‘each year just seems to go by faster and faster…’? And now, do you remember when you said exactly, exactly what you promised yourself that you would never utter? I don’t remember the day or the conversation, but I have definitely muttered those words. Many a times over. And then I said ‘ man, I sound like my mother’, smiled, and continued on. It happens. So, here I am about to say it again. Where is the time going? Seriously? It is Thanksgiving in 10 days! Was it not just July 4th 2009? And it’s Thanksgiving 2011 already? WHAT?!? You can say I am having a small moment. So, I am making an early (or really late, depending on how you look at it) New Year’s Resolution. I would like to be more present. Less time thinking about what I want to do/accomplish/cook/see/read/etc…and more time actually doing what I want to do. Maybe, just maybe doing this … time won’t feel like it is just flying by. Well, maybe it’ll still fly, but at least I’ll have a seat on the plane. I wanted to make bread. So guess what? 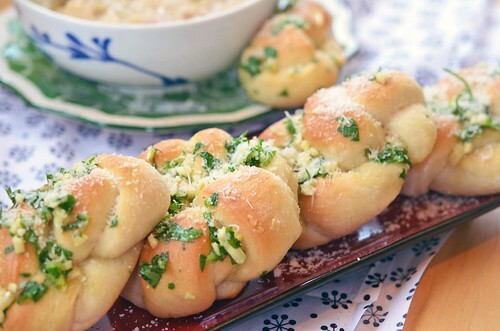 I made Garlic knots. I am so rocking out this resolution. Make these for this Thanksgiving dinner. Or tomorrow for dinner. Or next week for Sunday night dinner. Just promise me that you will make them. They are good. They are simple. Just please make sure that if you make these, you must share them. Make sure everyone at your dinner table eats at least one. 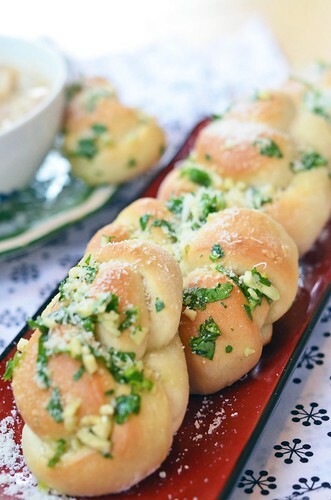 Because when you are serving garlicky foods…its a rule, everyone must eat the garlic. Therefore, the horrible garlic breath isn’t noticed because, well…everyone smells. Fact. In a small bowl/mixing cup, combine warm water, yeast, olive oil, sugar, and salt and stir to dissolve yeast. In a larger bowl, measure out the flour and then pour yeasty mixture into the flour and with a fork stir until it comes together (it should be lightly sticky, but not gooey. If it is too sticky, then add a bit more flour) Empty contents of bowl onto a lightly floured surface and knead dough for about 3 minutes or until the dough forms a smooth round ball (when it is lightly poked, the dough should rebound). Coat the mixing bowl with a bit of oil and place dough into bowl, lightly coating the dough with the oil from the bowl. Cover bowl with a dishtowel and place in a warm, draft free place for an hour or up to 3, or until the dough doubles in size. (The perfect warm draft free place in my house is the oven with just the oven light on, works like a charm). When the dough has risen to twice it’s size, empty out onto a lightly floured surface and with a rolling pin, roll dough out into a rectangle of sorts, measuring about 12 x 10 or so. With a pizza cutter or sharp knife, cut dough into 1 inch wide strips. Take each strip and tie into a knot and then fold/wrap in the ends. This does not need to be perfect, just make sure no ends are hanging out. 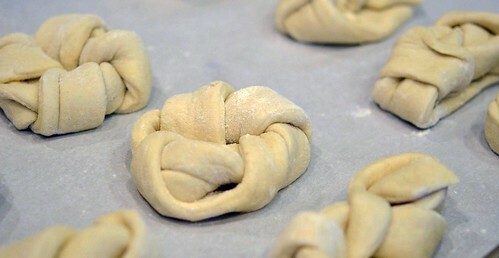 Place knot onto a parchment lined cookie sheet and continue making knots. When all the dough has been tied, cover with dishtowel, and place back into warm, draft free place for 30 minutes. Preheat oven to 400ºF. 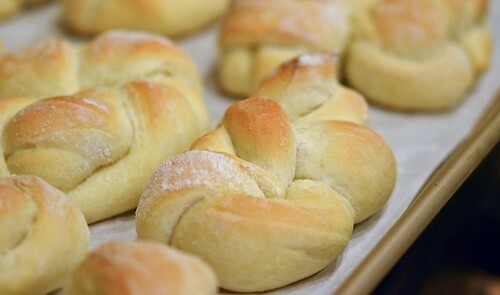 Bake knots for 15 to 18 minutes. Or until golden brown. Meanwhile, while the knots are baking, prepare the topping. 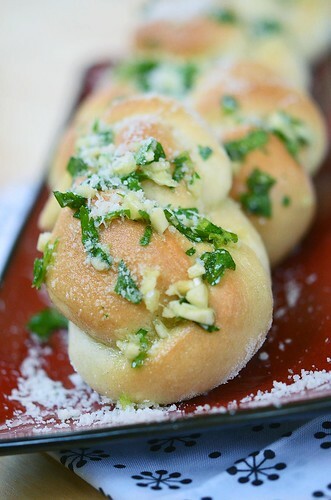 In a large bowl, combine the oil, melted butter, garlic, and parsley. Stir to combine. When the knots are done baking and still steaming hot, either brush the topping onto each knot or toss the knots in the mixture. 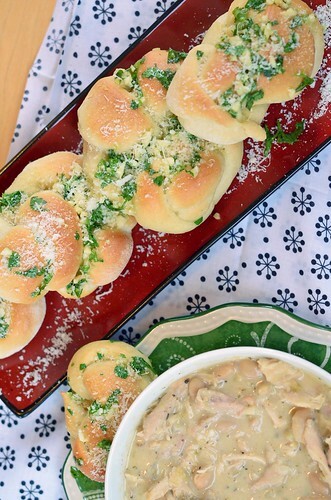 Either way…get the topping onto the knots as soon as they come out of the oven. Sprinkle with parmasean cheese, and enjoy immediately. Store in air tight container and when reheating, wrap knot in aluminum foil and bake in 350ºF for 5 to 10 minutes.